I had a chance to hang out at White on Rice Couple’s beautiful studio last month for a KitchenAid event. There’s a dreamy prop room. And an entire wall in their kitchen dedicated to hanging cutting boards; some old, some new, all beautiful pieces that add height, texture, and mood to a photo. And I wanted 5 of them. No, 10! Okay, okay. I’d settle for 7. Over the next couple of weeks, we’ll show you some of our latest DIY food styling & photography prop projects. We get to save money, I get new props, and my husband gets to do one of his favorite things ever: buy stuff from the lumber yard. I’ve mentioned it before, but woodworking is one of my husband’s favorite hobbies. He gets to work with power tools. Alone in the garage. And make stuff. I get it. I really do 🙂 You can imagine, then, that getting him to help me make some new wooden prop pieces was not like pulling teeth. As a matter of fact, he pretty much took over. 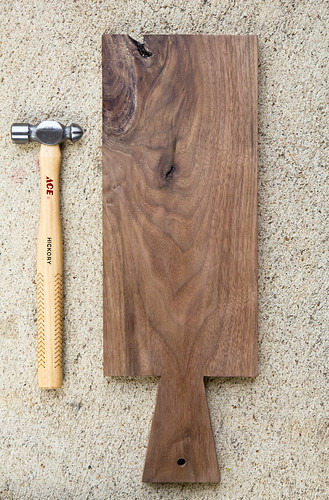 We took a stroll through a nearby lumber yard and found ourselves staring at a pretty 1×8 plank of solid walnut. The first board that we made was an ode to that $200 online beauty: dark, long, and straight with crisp angles. 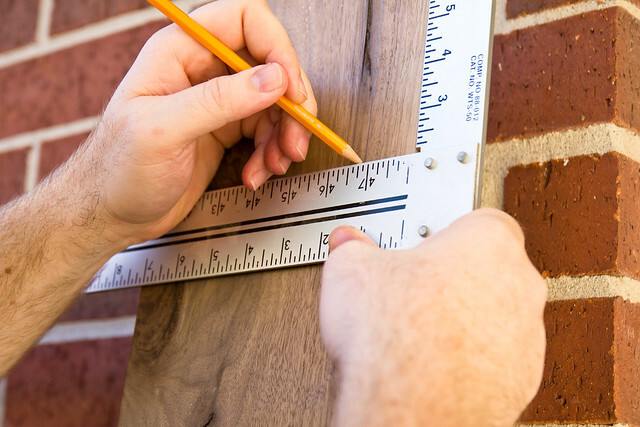 We marked out the measurements and traced the shape of the board directly onto the wood. We sanded the cut edges smooth: a pass with medium-grit sandpaper and then a pass with finer-grit to finish. 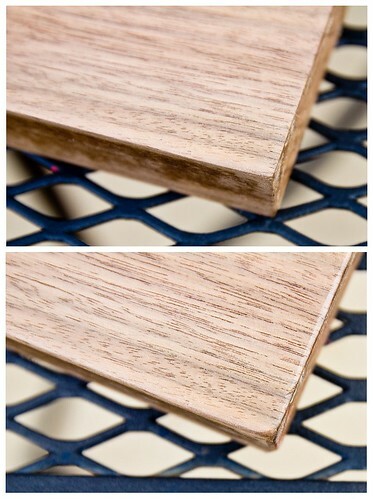 I used a small hammer to soften the crisp edges around the board to give it a slightly more worn look. I used a drill with a medium-sized round bit to drill a hole in the handle so I could loop some twine through it and have the option for hanging storage. 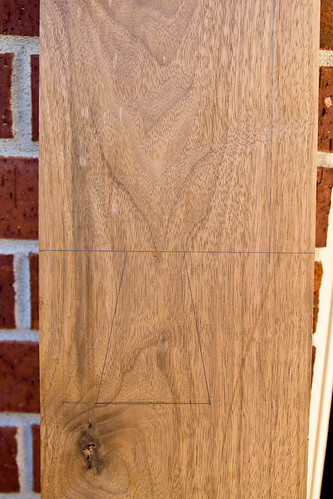 I rubbed the board with tung oil to bring out the grain and then finished it with a layer of finishing wax. It turned out beautiful! I love the smell of woodshops. My grandpa loved woodworking so I grew up with unique, handmade, personalized toys, decorations, etc. I love it! This post is similar to something I am doing right now, too! Years ago we had wooden grain elevators near here that were torn down and before they burned the debris, the community people could go through and pick out scraps. I picked up two post bases that I always intended to turn into picture frames. They are 22 inch square spruce 3/4 inch plywood pieces with a beveled edge. Because they were bases for load bearing posts, they had a small square in the middle the size of the post made with smaller, thinner beveled edge pieces. With some wordworking help from my dad, I sanded them down, stained them with a dark walnut Danish oil, and varnished them twice. Then put the little pieces in an 8×10 shape, and presto! Picture frames! 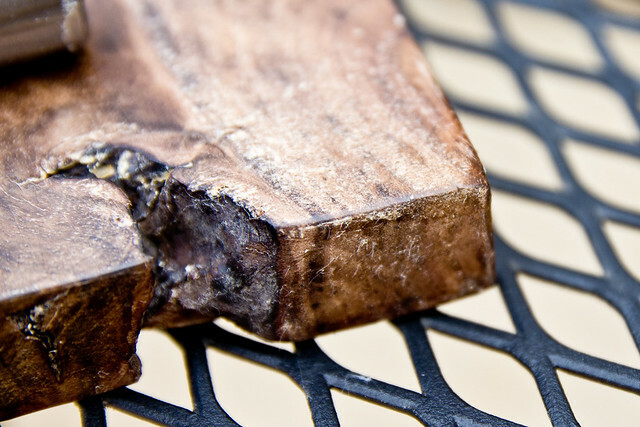 They look old, and worn and perfect, just like your cutting board. That sounds like an amazing project! And what history, too! Wow. That’s beautiful. I love when you show us stuff like this! I’ve been itching to go for a stroll through a local scrap yard to see what I can find too, because I almost fainted when I started shopping for beautiful cutting boards as well! We don’t have the garage/woodworking tools, but my husband sure loves to tinker and “be handy”. . . . Maybe I can enlist his help as well! I just refinished a resale shop find and turned it from light/golden to very, very dark. It’s cheap, easy, and I’ll have that tutorial posted soon! Looks beautiful – love handy husbands! Also – if you didn’t know already be very careful with Tung Oil on food surfaces, it is made from a nut and can cause a reaction for someone with an allergy. very nice! 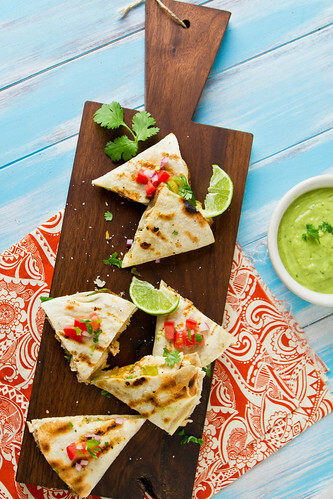 i need to make me some of these! beautiful!! can i borrow your hubby for some projects of my own? 😉 y’all did a great job! Gorgeous. Kudos to Mr. Foodie Bride! Great job, sir. Love your crafty husband, he sounds like mine! I have had this project on our to-do list for awhile, but all things baby come first. I’ll have to show the hubs this post to remind him about it. 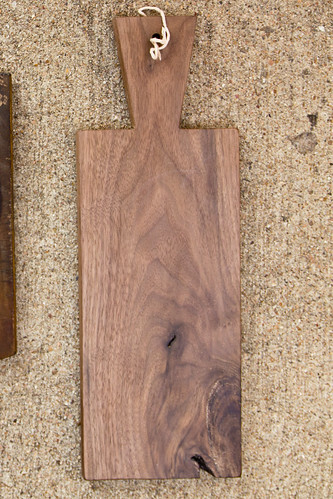 But wow…the cutting board is simply breathtaking…and A STEAL!!!!!!! LOVE!!!! Awesome tutorial!! Your board looks fabulous! That is so cool! The board looks almost as good as the food on top of it… I only say almost because I wouldn’t get to eat the board! That’s a super-looking board. I used to do all sorts of craft projects from small like your board to big like a makeover for a table. I am too busy with other things now but it would blend nicely with the food part of my blog. I use very few props and know that I should but when the family is waiting to eat while I photograph dinner, then the props get left out. I’m not sure how to get around that problem. Also the food gets cold if I move too slowly. Any advice? I’m super impressed. You two make quite the team! I gotta get my husband on this? I want one! I have a whole list of little projects like this for my husband. 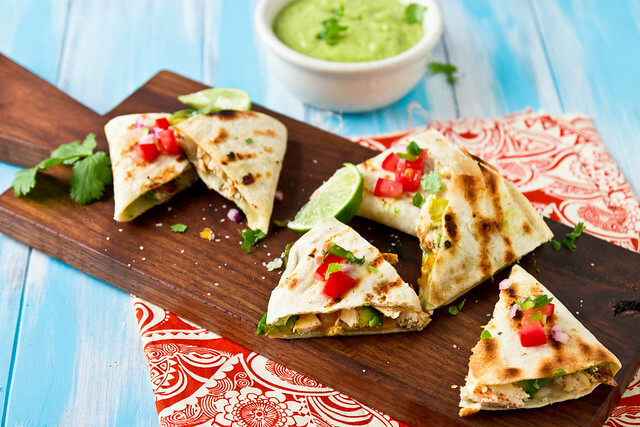 I also want those quesadillas in the photo! Yum! That’s really beautiful! I don’t have tools (or $200 lol) but I’d happily pay if you have an extra one! WOW this is gorgeous, I am going to try and convince my man to make me one now! Lucky you! Love my hubs to pieces but the one thing missing is handiness like that.